Automotive vehicle dynometer simulation with road-test features. Is there a better alternative to G_RoadTester? Is G_RoadTester really the best app in Applications category? Will G_RoadTester work good on macOS 10.13.4? 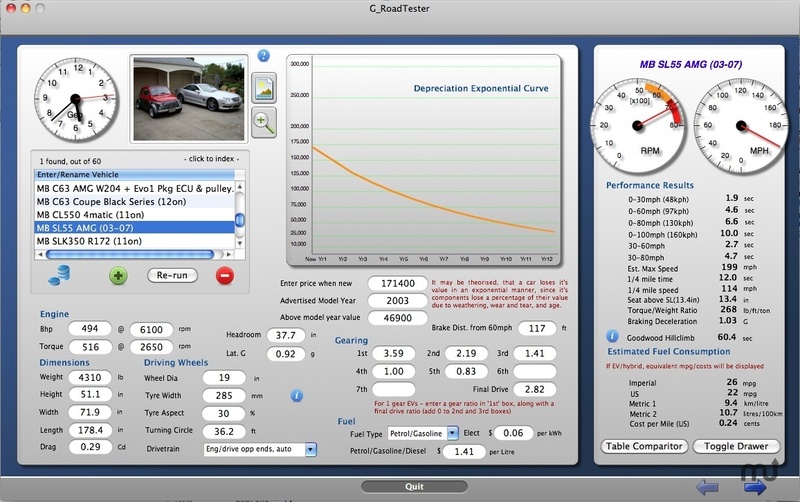 G_RoadTester is a professional high speed automotive vehicle dynometer simulation including road-test features. This program is a powerful assistant to have before and during engine tuning and modification. It gives instant confirmation of accurate results. It also has a professional and simple user interface so that anyone can set it up in a few minutes. It comes with sample database examples to get you started. Added vehicle photo and rtfd editor tabs, to display your vehicle views and notes. Also refinements added, such as an automatic theoretical computation of imperial miles per gallon, for each vehicle, including EVs. Can run a lap simulation. Tyre/Wheel Calculator with visual sizer. G_RoadTester needs a review. Be the first to review this app and get the discussion started! G_RoadTester needs a rating. Be the first to rate this app and get the discussion started!